Last weekend's unprecedented Vatican summit on child sexual abuse was closed with a Sunday homily by Australian Mark Coleridge, the Archbishop of Brisbane. "In sexual abuse," Archbishop Coleridge said, "the powerful lay hands on the Lord's… weakest and most vulnerable." He could have been describing his fellow countryman, Cardinal George Pell, for there are few as powerful to have fallen from grace within the Roman Catholic Church. Pell is certainly the most senior churchman to have been convicted of offences against children. Pell was appointed by the Pope as Prefect of the Secretariat of the Economy, which effectively runs the Vatican's voluminous finances. Following his appointment, he relocated to Rome from Australia, where he had been the Archbishop of Sydney since 2001. Pell, who began a five-year term in 2014 with offices on the first floor of the Apostolic Palace, quickly set about introducing new accounting standards, established the Holy See's financial watchdog to deal with suspicious transactions, and ensured that the Vatican Bank's accounts were independently audited. A bullish figure who faced plenty of obstruction, he was known among some officials as "Cardinal Rambo". But that was more a term of endearment – because Pell was having a positive impact on the church's finances. News of his conviction for child sexual abuse is a grave blow not just to the church, but also to Pope Francis personally. He was one of the Pope's closest aides. 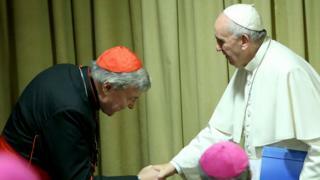 He was not only leading the crucial reform of the church's sprawling finances, but was also appointed by Francis to his nine-member Council of Cardinal Advisors, known as the C9. It was the C9 that encouraged Pope Francis to host this first-ever summit on child sexual abuse. But that was just one of many Vatican departments in which Pell played a significant role. Cardinal Pell was a member of the Congregation of Bishops, the Congregation for the Evangelisation of Peoples, the Congregation for the Institutes of the Consecrated Life and the Societies of Apostolic Life, and the Pontifical Council for the Promotion of the New Evangelisation. His conviction confirms that the poison of sexual abuse has infected every level of the Roman Catholic Church. Back in 2012, then Prime Minister Julia Gillard established a Royal Commission to inquire into institutional responses to child abuse in Australia. It found that 7% of priests in Australia had abused children. The charges against Pell emerged from Australia's rigorous inquiry into every institution that had access to children. The state began a process that the church itself seemed incapable of managing – and now this 77-year-old ambitious Cardinal will swap the Apostolic Palace for a jail cell. And in a final turn of providence, or coincidence, it won't even be necessary for Pope Francis to fire Cardinal Pell from office. His five-year term as Prefect of the Secretariat of the Economy expired on 24 February.